"Now, that's a good book," was what I said to myself as I closed Get Happy! : 7 Secrets to Creating the Life You Want by Elizabeth Bruce. "And an important one," I added as I thought about the review I would write. Why good? Why important? Hasn't the topic of how to "get happy" been written to death? Store bookshelves are crammed with authors or health experts giving us the formula for that elusive thing called happiness. What could Elizabeth Bruce tell us that we hadn't heard before, and that still hasn't brought us the happiness we seek? In Chapter 4, Elizabeth, a blogger and life coach, introduces her concept of a Happiness Blueprint based on Maslow's hierarchy of 7 basic needs. When those 7 needs are examined separately and closely, as she does in Get Happy!, we are each able to identify that one or more areas where our needs are not being met. And of course, if those needs aren't being met, that happy feeling we want will forever be fleeting and elusive. To help us remember those 7 areas, Elizabeth supplies an acronym for the word "happiness." 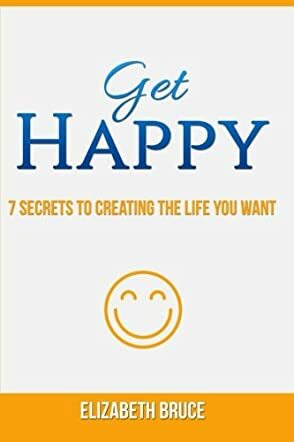 You will have to read the book to get that acronym and if you pick up Get Happy!, that's because you're looking for a way to, well, get happy. Elizabeth Bruce not only guides you through each step of this Happiness Blueprint, but she helps you understand why each area is so important to happiness, what past influences - your upbringing, culture, etc. - might be interfering with satisfying that particular need. She rounds up her treatise by reminding you that the power to change what is ingrained lies in your choices and what you tell yourself. The author provides exercises and copious examples to illustrate how this all works, and what exactly might be working against you. As a result, readers come away recognizing things they know on a much deeper level, but which day to day life forces them to ignore or bury. Don't assume for one moment that this book is like all the rest. It isn't! Elizabeth Bruce hands readers the shovels they need to unearth what they aren't facing. And what they discover, if they dig deeply and diligently is how to "get happy." Get Happy! : 7 Secrets to Creating the Life You Want is a non-fiction self-help book written by Elizabeth Bruce. The author is a peak potential coach who works with clients to help them find balance and happiness in their personal and professional lives. Her book is geared towards readers who are also looking to experience more happiness in their lives, and she presents an easy 7-step program to do so. Her strategy will work both for those who feel that everything has gone wrong with their lives as well as those who have everything they planned to have and still feel that they're missing something -- and anyone else in between those two extremes. Her 7 secrets are explained in an early chapter and then each of them is explored more fully on its own in later chapters. Bruce's book is an interactive one in that she provides the reader with thought-provoking exercises and assignments which are designed to help in assessing what is keeping one from feeling happy and to show one how to progress towards a happier state. Elizabeth Bruce's non-fiction self-help book, Get Happy! : 7 Secrets to Creating the Life You Want, is an easily accessible guide to self-improvement that will not take the average reader days to read, and that is by design. Bruce wants her readers to dive right into the process of getting happy, and her enthusiasm for her subject is definitely contagious. I found my initial skepticism quickly fading as I learned about her 7 secrets and began to work through the exercises she recommends each reader complete. It's an illuminating experience, and one that is well worth anyone's time. Bruce's writing style is conversational and communicative, and she often includes simple case studies to assist the reader in understanding concepts, which I found quite helpful. After all, who doesn't want to get happy? Get Happy! : 7 Secrets to Creating the Life You Want is highly recommended. We all look for happiness in our lives and most of us realize that it is not so easy to be happy - happiness is elusive and evades us most of the time. Get Happy! 7 Secrets to Creating the Life You Want by Elizabeth Bruce is an uplifting book that gives readers tips to unlock 7 secrets to create the life one wants, and to lead a life filled with joyful satisfaction. Many of us have rough areas in our lives which cannot be fixed in a manner that makes them feel worthwhile. By reading this book, readers will know quickly what is preventing them from being completely happy, and how to wake up every morning and face each day with enthusiasm. So what are you waiting for? Open this book and read through the pages to find the method that contains the key to the happiness that we all are seeking. I found the book simple and easy to practice, unlike many other books written on finding happiness. It helps you prioritize things in your life and is a fun and challenging read which does not require a lot of your time. The Happiness Blueprint is easy to apply and it is simple enough to identify the areas of discord and work on them. The book is also a useful tool to understanding ourselves better and creating a balance which in turn leads to happiness. For all those looking into making changes in their lives positively, this is definitely the book they need to read! A great book. Easy to practice tips, and it is helpful in finding out what is stopping us from being completely happy.